A funicular railway descending from the Terrasse Dufferin in Old Quebec in Quebec City, Canada. In Old Quebec, Canada you can be transported from the Terrasse Dufferin to the Rue du Petite-Champlain by a funicular railway. 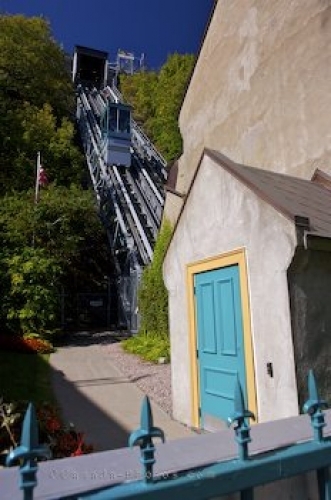 A funicular is a railway that has two cars joined to each other by a cable running on a pulley that goes up and down on a very steep slope and each of the cars counterbalances each other. A very unique way for visitors to get between some of the major tourist areas of Old Quebec, Canada. Funicular descending from the Terrasse Dufferin to Rue du Petite-Champlain in Quartier Petite ChamplainOld Quebec City, Quebec, Canada. UNESCO World Heritage Site. Picture of the funicular railway moving down from the Terrasse Dufferin in Old Quebec, Canada.